Fresh off a trip to San Francisco with visions (or is it just intense cravings?) of fresh sushi dancing in our heads, my captive dining partner and I decided to search for some fresh catch in Portland. Knowing this would be a tough task we decided to head down to Sapporo on Commercial Street because we went there about a year and a half ago and Mark remembered it being a, “good bang for the buck.” That statement usually means cheap, bad food in my experience, but I was willing to hear him out and give it a shot. We were promptly seated upon arrival. Being one of only three tables dining there gave me little hope for what was to come. The place is aptly decorated, though a little too cliché for my taste. I think it could use more real bamboo or actual Japanese style booths to create a better ambiance. Granted I have never been to Japan, so I don’t know what the “authentic” décor would look like, but in my mind I don’t think this is it. When our waitress finally came to take our order we decided on house salads with homemade ginger dressing to start, and Mark ordered three of the most boring sushi rolls ever— spicy tuna, spicy scallop and tuna avocado. I think he was hoping there was no way they could screw them up. I ordered the sashimi platter. 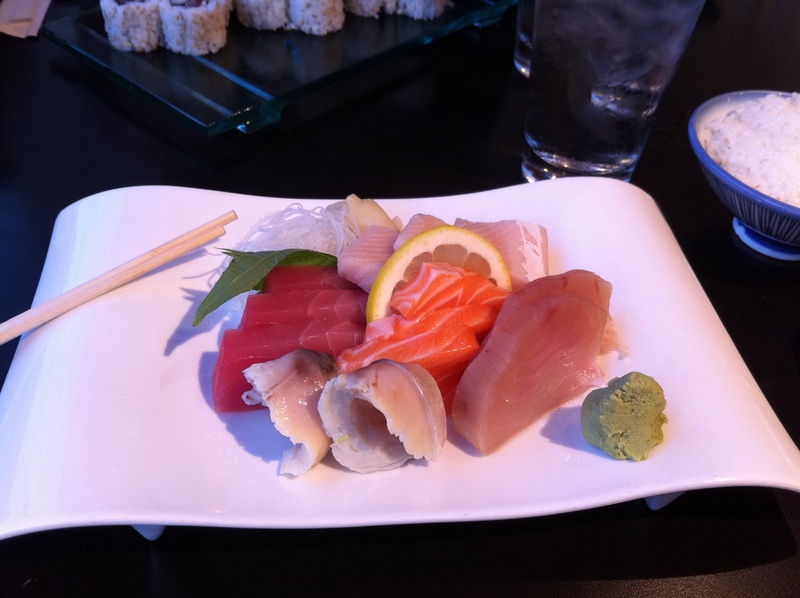 It came with Albacore, Salmon, Yellowtail, Mackerel and Tuna. The salad was by far the best part of the meal. I must say this sushi and the rolls were lackluster. My sashimi was definitely not the freshest I have had. The yellowtail was by far the best one on the platter. The mackerel was oily and tasted fishy, something I have never experienced while eating sushi before. I only ate one piece of it. For the price (in defense of Sapporo, it is really cheap) I guess it could fall into the “bang for your buck” category. I am just not sure that I would return. Lately, I have really lamenting the fact that Portland doesn’t have a reasonably priced sushi place for me to patronize. I mean who can afford to go to Mikaye all the time? Does anyone have suggestions of some other places to try? We haven’t been to Benkay in a while…maybe it’s time to give that another go? Having eaten my fair share of ramen, in both the restaurant and the horrible sodium laden bagged college dorm room variety, I have always had an affinity for the stuff. Upon hearing that food factory Miyake was opening a ramen joint, I knew I had to try it. No opportunities came up for a few weeks until we were supposed to meet our friends Marshall and Heather at Norm’s for some pub grub before the Bright Eyes concert on March 11th and found there wasn’t a seat to be had there for at least an hour. On our tight schedule that wasn’t going to cut it. We only had about two before the the concert to eat and have a few cocktails…so in the pouring rain we marched up to Local 188, where yet again, there was no room at the inn. 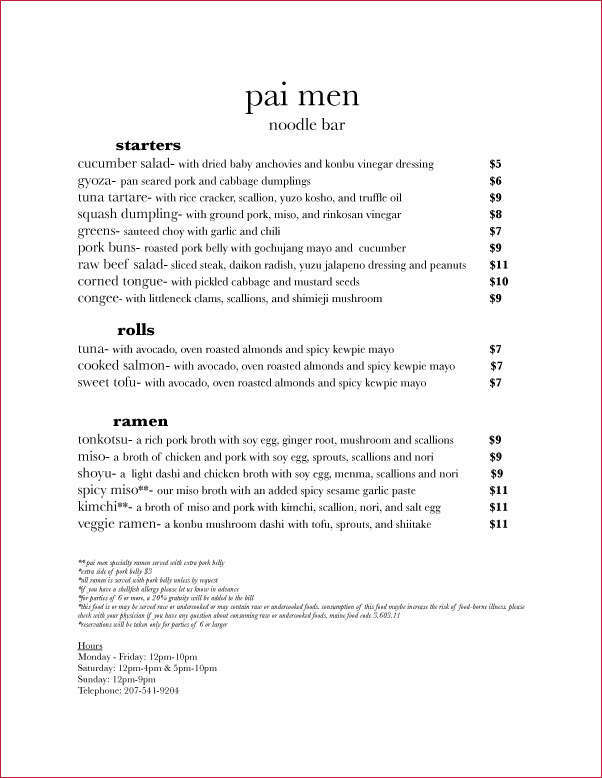 So, as a last ditch effort (I thought it would be totally booked) we strolled over to Pai Men Miyake for some dinner. There was a free table right by the door as we walked in, so luckily, we were promptly seated and handed menus. I neglected to bring my camera with me…so this menu will have to suffice. The ambiance was very simple and tasteful with lots of natural wood accents and a less than expected feng shui vibe. The restaurant was bustling with life, but not in an annoyingly noisy way, but a carefree way that makes you feel like you can laugh with your table and not live in fear of being judged. The crowd was younger and urban, but seemed kid friendly if you have well-behaved little foodies who enjoy ethnic cuisine. The seats by the door were a little drafty, but there were heaters everywhere to cut the late winter chill. Since it was Friday during Lent, my husband, being the good Catholic that he is started with the cucumber salad. Marshall, resident carnivore, had the Pork Belly Sliders, while Heather had the Pork Dumplings. I opted for nothing besides sipping my Japanese beer and waiting on my ramen! YUM! When the appetizers came, they looked delicious and everyone dug right in. Marshall and Heather enjoyed their pork while Mark lamented the fact that he was forced to eat cucumbers…he claims he still liked it though. It did look delicious and fresh! For entrees everyone but me opted for a sushi dish. 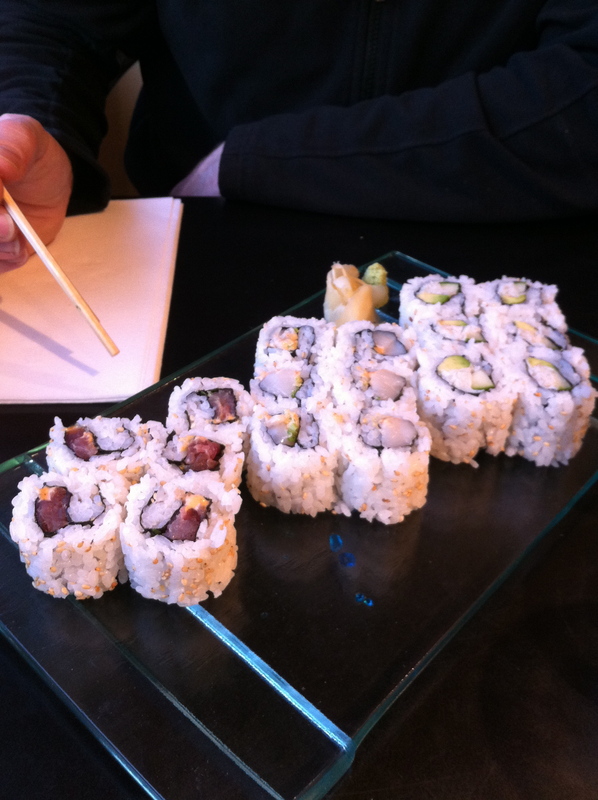 Mark got a tuna and a salmon roll,and Marshall and Heather each got a tuna roll. I ordered the Veggie Ramen. When dinners were presented everything looked amazing and my ramen smelled divine! There were plenty of shitake mushroom pieces in my ramen and the broth was flavored, but not overbearing, and not as salty as I have had other places, which was a welcome relief. The rolls each had about 10 large pieces to them with lovely almonds slices for garnishes and looked simple and delicious. My husband said he loved the sushi, but hey, who wouldn’t expect great sushi at a place bearing the Miyake name? Overall, I felt it was a great meal at a great price point. The ramen’s are reasonably priced and filling. Had we not ordered several drinks a piece I think we could have easily squeezed out of there paying just a little over $40 a couple with apps, sushi and ramen. So, go ahead Portland, it’s been open long enough to work the kinks out! You won’t be disappointed.